One has little choice but to blame the DIRECT cause of these deaths on Terry Jones in Florida – a bigot and an utterly irresponsible fool. To date the foolish leaders of certain Western World Countries have under questionable lawful claims invaded the Sovereign Nation of Afghanistan without clear legitimacy to kill its government and those who may support it. There seems absolutely zero withdrawal concept or plan and little or no understanding of what they aimed, planned or were there to do. It seems a part of the plan was to shoot people who didn’t buy into the, to the indigenous peoples, strange concept of America’s style/concept of democracy! This particular outrage by the idiot Terry Jones has played right into the hands of those aiming to control Afghanistan when America, Britain etc. are chucked out, as they surely will be. Variously reported, either eight or seven UN workers have been slaughtered by local Afghanis in the northern city of Mazar-i-Sharif, four or five of them apparently Nepalese guards. Two of the guards were beheaded. The killings arose after a protest by about 2,000 people outside the UN compound in the city, against the burning of a copy of the Koran by an American pastor. Although it started relatively peacefully, it got out control when some protesters grabbed weapons from the UN guards, opened fire on the police, and then stormed the compound, setting fire to buildings. Heavy smoke was seen. This is said to be the worst-ever attack on UN personnel, with unconfirmed reports that the head of the UN Military Assistance Mission was also seriously injured. The death toll may rise to as many as twenty, and at least four of the protestors are said to have been killed. Although the proximate cause is an evangelical preacher by the name of Terry Jones, who on 20 March at a small fringe church in Gainesville, Florida, presided over the burning of a Koran, there is much more to these murders than just that incident. 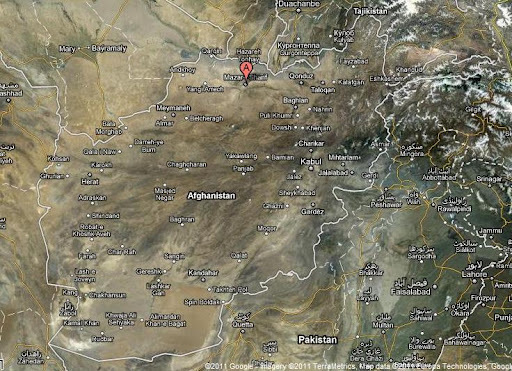 We are not talking here about a primitive, Taliban-ridden outpost of Afghanistan, but the country’s fourth-largest city with a population of close on half a million and rising (location below, marked “A”). This is a holy city – Mazari Sharif means “Noble Shrine”, a reference to the large, blue-tiled sanctuary and mosque in the centre of the city known as the Shrine of Hazrat Ali or the Blue Mosque. It is believed that the site of the tomb of Ali ibn Abi Talib, the cousin and son-in-law of Prophet Mohammed, is in Mazari Sharif. Although, by Afghan standards, the city is relatively prosperous and settled, benefitting from both the illicit drugs and gun smuggling trades, the religious connections make it prey to rabble rousers. But what is intriguing is that the violence should be directed at the UN, which supports a substantial reconstruction and aid programme in the city. The reason, says Christian Science Monitor is an increasing tension and annoyance with the international presence. For some many years, Afghanis have understood that the bulk of the aid programme is soaked up by the aid agencies themselves, with field workers paid huge salaries and perks, while their own professional classes are poorly paid, and sometimes not at all. 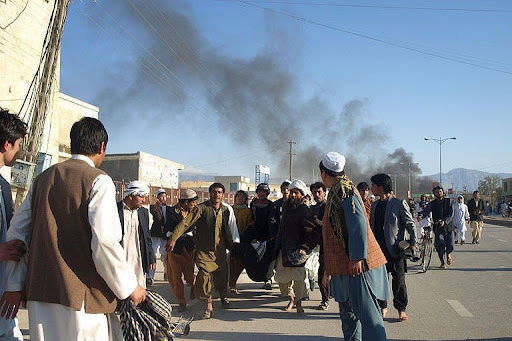 Focusing wrath on the UN, therefore, is not difficult, but when such a violent episode is seen in one of the most settled areas of Afghanistan, it affords little confidence that the rest of the country can ever be considered safe. And what makes this especially relevant is that the city has been slated to be amongst the first where security is to be handed to indigenous forces. If this has to be delayed, then it sets the whole hand-over programme back, upon which withdrawal plans depend. The outcome of the 4-500 years of inter tribal war and clan strife in Afghanistan once the struggle between Pakistan (The Pahtune – Taliban) and India (Dehli educated Indian asset Kharzai) and their respective peoples – once the Western World is forced out we will see China come in – NOT with an interest in either drugs or oil as the whole world is awash with oil and drugs. 02. The world’s largest untapped copper resource! Without copper you can produce as much power as you like with nuclear, coal, oil, many such fuels or even if you are a green running a glow worm farm fed on mulberry bushes without copper you CAN NOT move the power from one place to another! Terry Jones may seem responsible for 7 or 8 deaths so far – how about the deaths that are increasingly becoming inevitable as power fails in the Western World due in part to bigots, in part to Ludites running away from nuclear power and tour only hope and in part to the short termism delineated by political expediency. Perhaps you had not noticed – China thinks in Centuries! Previous Previous post: #G0452* – HAS GOSPORT COUNCIL AIDED A £400K FRAUD?